Bethesda Senior Designer Joel Burgess offered some insights into his company's iterative design processes. Every developer and publisher has their own design philosophies, and Senior Developer Joel Burgess of Bethesda took to the stage at GDC 2014 to offer some insight on just how the company handles the process in a session entitled "Level Design in a Day: How We Used Iterative Level Design to Ship Skyrim and Fallout 3." Although most of the talk was dedicated to particulars of the design process, which are not likely to be of any interest to those who aren't already, or are at least actively pursuing, a career in Level Design, Burgess did share some insights that go beyond just designing games. The essence of the talk was about the process of iteration, so he naturally touched on its merits early on. Perhaps most interesting was Bethesda takes several passes at the design of a game throughout development. Along the way to a final build is the "Content Complete" pass, as Burgess called it. He did eventually confess to the fact that internally, they call it the "Ship With Shame" pass. This is the point in the game where it's technically complete, passable by most measures, but it's not something you'd ever be proud of. He said the games industry in general tends to schedule games for "done" when they should be scheduling for "good." It's not enough to have a complete game. You should strive to have a good game. Burgess also spoke of the the "polish" pass, which is, in reality, as many passes as can possibly be fit into the schedule for the game. No game is ever "finished," he said, but you should "do the best you can" with what time you have. Never be content with "acceptable." Always work to be better, he said. 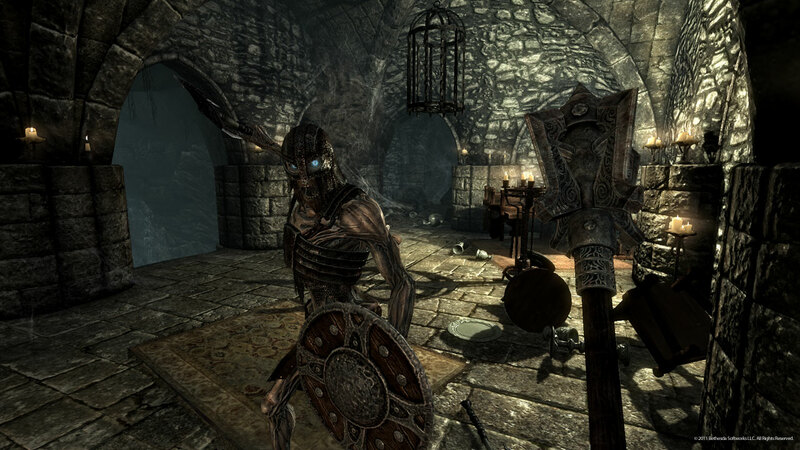 Burgess explained that the first early iterative passes tend to yield the most impressive results in terms of improved quality, and that this process can be applied outside of just game dungeons and the like. Considering that the first pass is going to expose, and then iron out, the most serious issues, this makes perfect sense. You can't expect to be putting a coat of polish on your new UI after only a single attempt. Instead of trying to make a complete UI on your first attempt, Burgess contends, it's more sensible to make a bare bones structure that the team will follow, make that a first pass, and then refine it from there. This approach was used in both Fallout 3 and Skyrim, two incredibly well-created worlds. As the game gets closer to ship, crunch becomes a fact of life, where developers and designers put in 12-hour days near the end of development to ensure a game releases on schedule. Burgess, while no more a fan of crunch than any reasonable person, did at least acknowledge the potential value. Sometimes you're just a few working hours short of making something truly great. If you're not already in crunch mode, you can commit a few extra hours of your life to making your work its best, and that is definitely to be commended. At the same time, though, Burgess called crunch a "blunt instrument," and "the least intelligent thing to do." His suggestion was to plan better, work smarter, instead of working longer hours. If you absolutely must crunch, it's not to be dissuaded, but that you shouldn't rely on it, particularly in the long term.